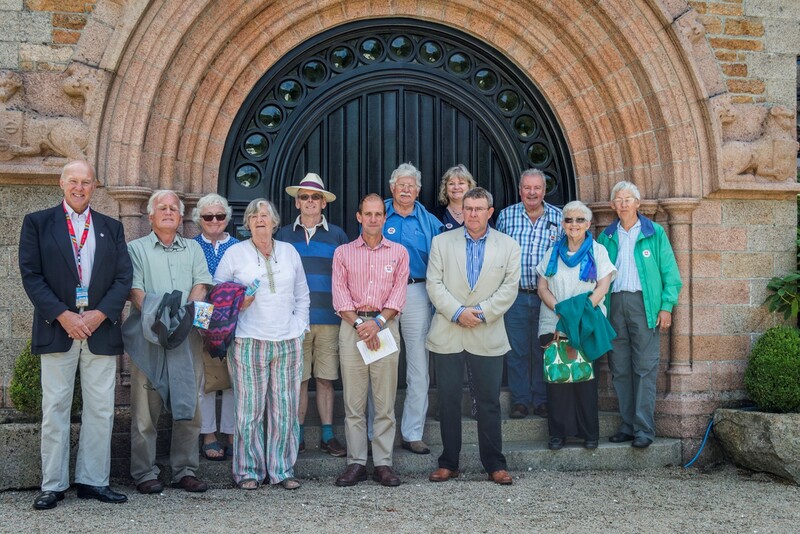 Following the visit of Jersey dignitaries and officials of the Parish of St. Ouen for Sark’s 450th Charter Anniversary Celebrations, a party of Sark people travelled to Jersey over the weekend of 14-16th August to return the compliment and be guests of the Seigneur of St. Ouen, Charlie Malet de Carteret and his wife Georgina, who treated the guests to a private tour of the Manoir and displayed some of the fascinating charters, prints, paintings and artefacts of Sark not usually viewable to the public. Highlight of the weekend was the Fete de St. Ouen, revived especially for this 450th Anniversary and called “The St. Ouen/Sark 450th Anniversary Fete”, held in the beautiful grounds of Le Manoir de St. Ouen. The whole day was in aid of Channel Islands Air Search, and featured all the usual Fete attractions plus Marching Bands, Falconry displays, Police Dog Displays; Model Boat Displays and Racing on Le Manoir Lake; and a Donkey Derby (which included the St. Ouen Seigneur’s Sark Stakes Race). 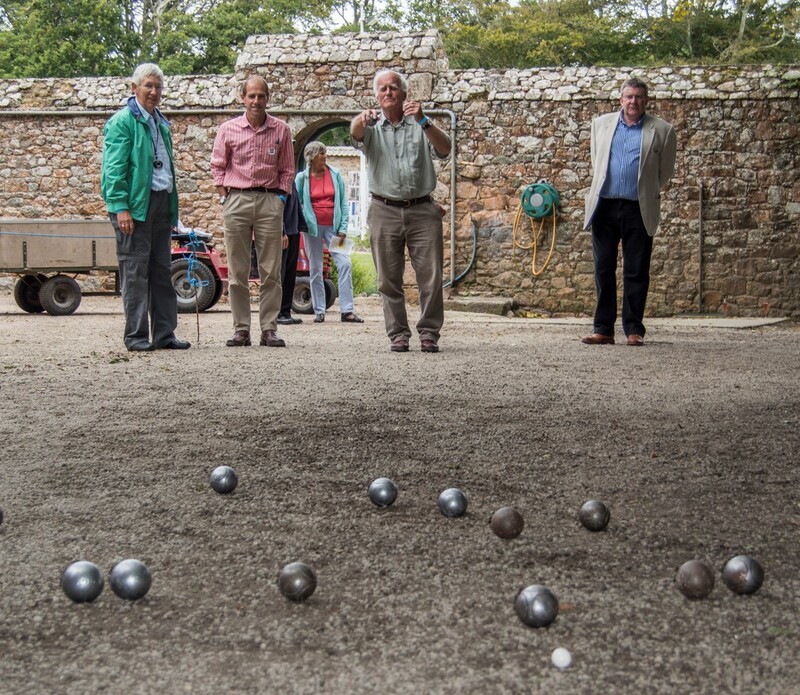 The Sark contingent played a match of boules with the Jersey team. Sark beat them on their home turf the week before, but in a very close fought competition we lost on this occasion by just three points. 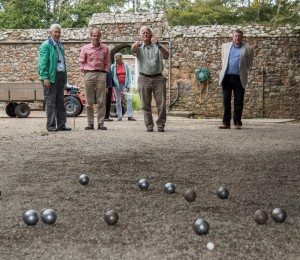 The St Ouen’s Petanque club are very keen to make this annual event which can only foster even closer links between the two islands. The day concluded in the evening with a Gala Dinner, also in aid of C.I.A.S., held in a marquee in the grounds of the Manoir. Throughout the weekend Sark was at the forefront of events, constantly being mentioned and promoted. The Jersey Evening post did a feature on the Islands links. Jersey Youth Theatre performed several sketches enacting the history of Sark and the de Carteret’s involvement, two Jersiaise speakers performed a humorous sketch about the first settlers. All the publicity material featured Sark and the Map created by Sark School for Sark’s pageant was in pride of place at the Gala Ball. Michael Paddock, Constable of St. Ouen, Richard Axton, Wendy Kiernan, Genette Dogtagalou, Ray Lowe, Jeremy La Trobe-Bateman, Reg Guille, Louise Dewe, Seigneur Charlie Malet de Carteret, Arthur Rolfe, Katie Hamon, Jan Guy.